Treat dry, dehydrated skin to a boost of weightless moisture. 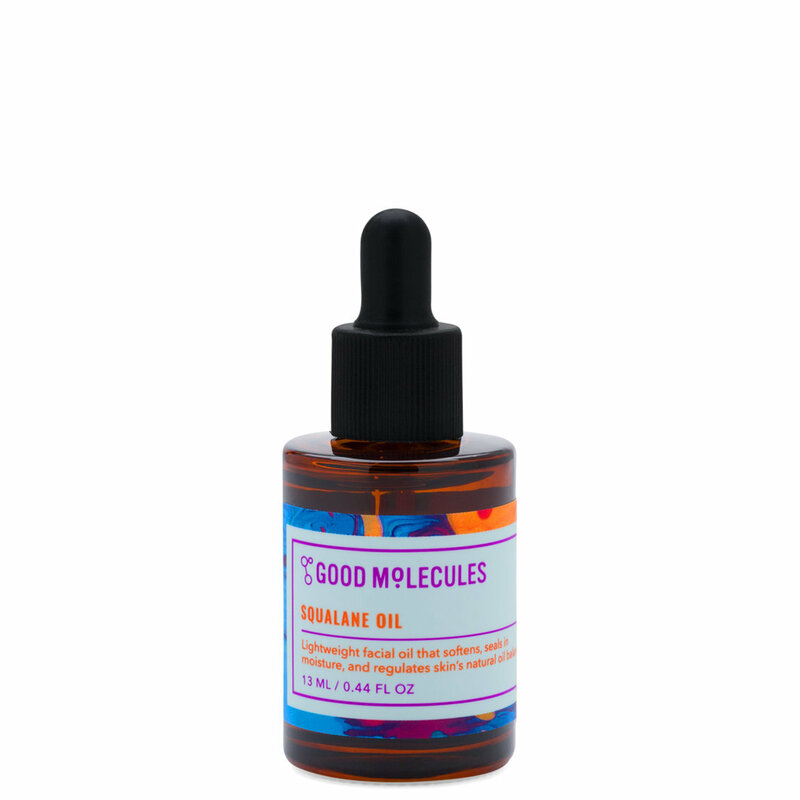 Good Molecules Squalane Oil is made with 100% plant-derived squalane to soften and seal in moisture for a healthy, hydrated complexion. 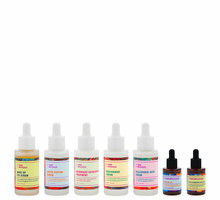 Apply a few drops to skin in the morning and at night after serums and other treatments. Let absorb for 30 seconds. Suitable for daily use on all skin types. I have insanely dry, sensitive skin and I’m always on the hunt for something that will hydrate without clogging my pores or breaking me out. I’m always excited but skeptical to try new products because if you’re like me and have sensitive skin, you know that you run the risk of breaking out if a product doesn’t agree with you. Fast forward to my discovery of this. A colleague of mine was ranting and raving that I should try this Squalane Oil and my first thought was, “Eh, what if it breaks me out?” She insisted I try it and since I always trust her skincare recommendations I finally did—and I am so very glad I did! This is by far one of the most rebalancing and soothing oils I have ever used. The formula is an extremely lightweight oils that does NOT clog my pores or break me out but best of all, it keeps me hydrated all day long. I couldn’t ask for anything more. I’ve been searching for an oil like this for so long and I’ve finally found it! This oil gives your skin what it needs and doesn’t look or feel greasy, just hydrated. I like to follow up with my Caudalie Vine[activ] 3-in-1 Moisturizer after using this and I have the most beautiful glow that lasts all day long. And don’t get me wrong, this isn’t my first experience with Squalane oil but it certainly is my best. I find other Squalane oils too greasy or not balancing enough. I also appreciate that this bottle is tinted to better preserve the oil inside. I’ve tried mixing a drop or two in my foundation and it prevents my makeup from getting cakey. Hands down an A+ for me. This is perfect. Super lightweight and absorbs right into the skin in seconds. I LOVE this oil. Just received it and had to open it, I have other squalene oils and this one is so different, it just sinks right into your skin. Can’t wait to use this for awhile to see how it works to help my dry skin especially my chin area. One complaint, wish this was a bigger bottle it’s only 13mil quite small. Most oils/serums are 30mil. I find that this products performs different than any other oils I've tried, unlike typical oils the product doesn't sit on the skin but absorb everything underneath it leaving my skin ''normal''. I have acne prone skin and am usually scared of applying oils to my already ''oily'' skin, however this is just something else. In my skincare routine I first wash any leftover makeup residue with the murad Clarifying face cleanser, then I mist some of murads hydrating face toner (Alcohol free), then I add a few drops of the Good molecules Hyaluronic and follow up with my serums and treatments, and after everything I seal all of my treatments and moisturisers with the good molecules squalene oil and it works wonder!! When I go to sleep my face isn't tacky, sticky, and most importantly doesn't stick to my pillow. BUY IT, its only 8 DOLLARS!!! This oil is very very light weight and absorbs super quickly into the skin, so quickly that you can actually use it under your makeup! I think it can be a great every day oil for keeping your skin moisturized, but as for a very hydrating oil that can give your skin more of a hydration boost, I would use the Ultra hydrating oil from Good Molecules or another heavier oil! Was very kindly sent this by Beautylish to try. As with the rest of their products, I love the packaging both on the box and the label. It comes in the cutest little bottle with a tiny dropper that allows you to dispense a precise amount of product (I think I'll keep the bottle for other oils even when I'm done with this!). Similar to the one by The Ordinary, this contains 100% Squalane oil. It sinks quickly into my oily/ combination/ acne-prone (worst of all worlds) skin without leaving any greasy residue. I use this during the day before I apply my sunscreen and makeup and it acts well as a makeup primer (I use Gressa or 100% Pure foundation and they layer well). The bottle is a smaller size than the oils from The Ordinary which are 1 oz/ 30 ml compared to this which is 0.44 oz / 13 ml, but I only need 1-2 tiny drops for my whole face. I can see this little bottle lasting me a long time. Plus the size is great for travelling. I hope they continue to expand their line (with more alcohol-free and silicone-free products to choose from!!)! One of my new fave facial oils! With the weather being a little colder where I live, my skin being combo/dehydrated needed more hydration & moisture during the day so I decided to get a squalene oil to add to my AM routine. I am absolutely happy with this oil and it definitely also helps my makeup look better by tackling the dry areas around my mouth. I can see myself using this year round as it's not a heavy oil to mix with my serum/moisturizer. I've been using it for two weeks straight now (every morning) and I have had zero issues with it - no clogging pores, no breakouts, no irritation. Came back to rewrite my review BC it is THAT good! So I really liked this oil from the get go, but now weeks out, I'm realizing it's a star product that I will likely keep using forever! I have extremely reactive combination skin and a lot of different types of oils have broken me out in the bast. This oil is so light, but SO hydrating and has not caused any reactions. My skin is actually better than ever right now. I use it morning and night under my moisturizer and serums and do a really strong facial massage with it to really get the blood flowing. I swear, it makes my skin look SO glowy and dewey after doing that in the morning and keeps it that way all day! I'm totally hooked! I’ve been using this for a few days and I enjoy it. I used the squalane x retinol from the ordinary which I liked but I couldn’t stand the smell. This oil doesn’t have a smell and it doesn’t irritate my skin. I have dry dehydrated skin and this does a good job of hydrating without feeling heavy. For the winter I’d probably switch to their heavier oil but as the weather is getting warmer this is perfect for using day and night.